This charming cottage is ideally situated for lovers of outdoor pursuits. Located in the picturesque Avon valley with local pub on the edge of the New Forest National Park and within easy reach of the coast you re sure to enjoy exploring the many walking and cycling routes in the surrounding area. Further afield take a trip to nearby Ringwood and Christchurch where you can while away an afternoon browsing the shops or relax in one of the popular cafes. For more of an adventure why not visit the local outdoor activity centre or try your hand at fishing. Stepping inside you enter the stylish open-plan lounge/kitchen/diner which has been furnished with care to ensure all of your comforts are considered. The kitchen area is well-equipped with an electric oven and hob fridge with ice compartment and microwave. There is comfortable dining space adjacent to the kitchen area perfect for a cosy meal for two or a lazy breakfast. Just next door is the contemporary shower room with WC. Take time to relax in the inviting lounge area where you can relax after a day of exploring and watch your favourite movie on the Smart TV. From this room a staircase leads to an enticing mezzanine style double bedroom with restricted head height overlooking the lounge. 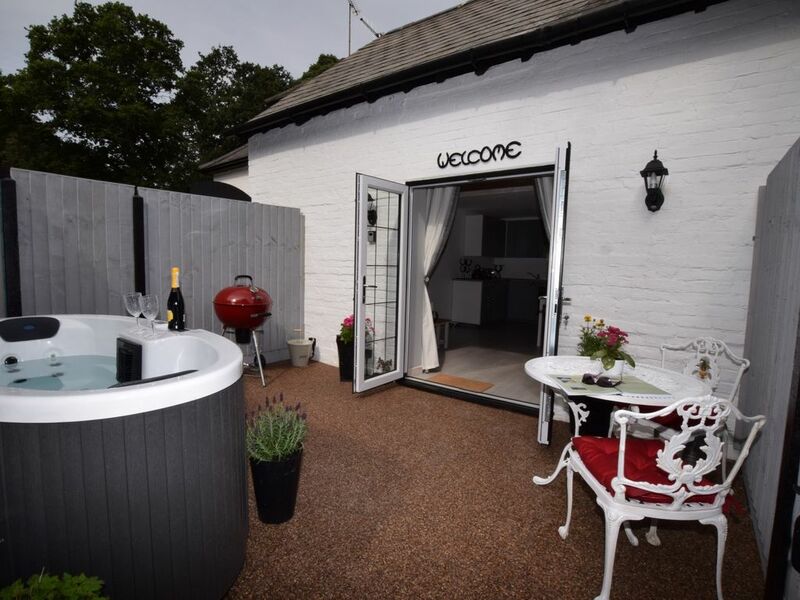 Heading outside you will find a private enclosed terrace with garden furniture a charcoal BBQ and hot tub. This area is perfect for a spot of al fresco dining and getting some fresh air. Off-road parking for one car is available to the rear of the cottage with shared path leading to property entrance. Absolutely perfect!! A beautiful, cosy, peaceful hideaway for two. Shire Cottage, within the stunning grounds of the Coach House, was the perfect, ideallic, peaceful getaway from the hustle and bustle of normal daily life. The cottage is imaculate and kept to a very high standard. Everything from toiletries and bathrobes to homemade scones are ready for you on arrival. The hot tub is constantly ready for you at any time and you have complete privacy. We would, without any hesitation, recommend a stay here and you won't be disappointed. We will definitely return to this wonderful hidden gem.